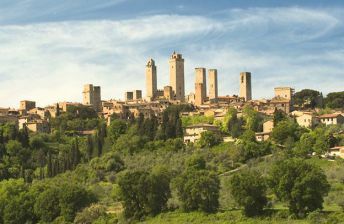 San Gimignano - wine tasting and sightseeing tour with Tuscany Wine Tours. 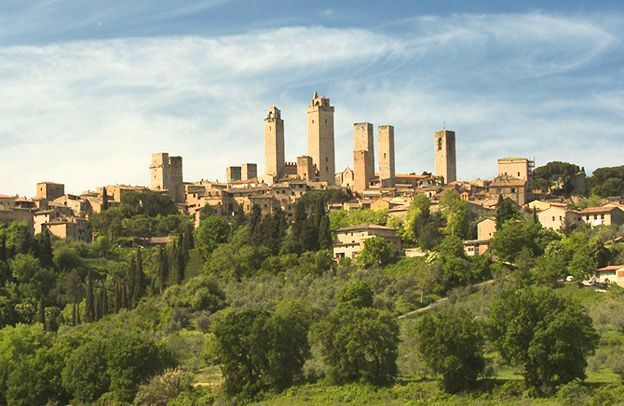 You will be picked up at the designated meeting point in Florence and we'll set out for San Gimignano, one of the most picturesque and intact mediaeval hill towns in Tuscany. San Gimignano is built mainly of brick and has 14 tower houses, and is enclosed within an outer wall that has five gates. On the way to San Gimignano we will visit a Chianti winery for a wine tasting. During our drive to San Gimignano, we’ll admire the gorgeous landscape with vineyards, producing the famous Vernaccia di San Gimignano DOCG white wine, olive groves, cypress trees, fields of sunflowers and poppies. We’ll visit the Piazza della Cisterna, the Fortress with its amazing view over the countryside and the towers, the Palazzo del Popolo and its picture gallery, the beautiful lane known as the Via degli Innocenti with incredible view over the town. There will be time for a stroll through the centre of town where you can shop at the local stores. • 10:30 a.m. Arrival at a small family-owned winery and visit the vineyard and cellar. • 1.00 p.m. Light lunch in the country at an old farm house. This lunch is based around home-made saffron-flavoured items, including saffron-flavoured gelato, accompanied by the appropriate aromatic wines, San Gimignano being famous for Tuscan saffron. • 2:45 p.m. Visit to the town of San Gimignano where you will also have a little time to shop for local products. What time does the tour start? At 9.15 a.m.